3 strut SLE Hybrid which is a mix between an C-Shape and a Delta kite. Riders looking for simple, no-fuss performance. The Park is a performance-focused kite condensed into an easy, simple package. The Park's three-strut design is stable and responsive. This configuration, combined with a powerful profile and full outline gives the Park the consistent pull of a "C" type kite and the power control of a swept kite. The swept leading edge positions the wingtips behind the center of the kite, which gives the kite easy relaunch capabilities and maximizes depower. Riders looking for no-fuss performance freeride/allround kite. The Park's three-strut design is stable and responsive. This configuration, combined with a powerful profile and full outline gives the Park the consistent pull of a "C" type kite and the power control of a swept kite. The swept leading edge positions the wingtips behind the center of the kite, which gives the kite easy relaunch capabilities and maximizes depower. The Naish Park has a number of noticeable characteristics. It’s stability, gradual power-buildup and controllability when depowered will appeal to beginners and all-rounders. But also wave riders are offered an interesting set of characteristics; a lot of feedback when at the edge of the wind window and a short turning circle in the whole power range (even when there is little tension on the steering lines). The Park is a lively and playful kite. The gradual buildup of power and the way you can follow the kite through the steering lines prevents you from being surprised by the Park. Nevertheless, you can generate some serious boost when looping the kite. Freestylers will be pleased by the controlled loop power and the pop, in particular in the high end. Negatives? Perhaps heavier riders will need to consider to choose one size larger when using the Park in its low end. Choosing a different board to adapt to the conditions is, of course, also an option. Surfboard riders will not directly run into low-end performance issues due to the Parks quick turns and direct reaction to steering action. The Naish Park is a good all-round kite suitable for various disciplines. It is a reliable kite which can be used in a large range of conditions. The quality and the finish of the kite is good. 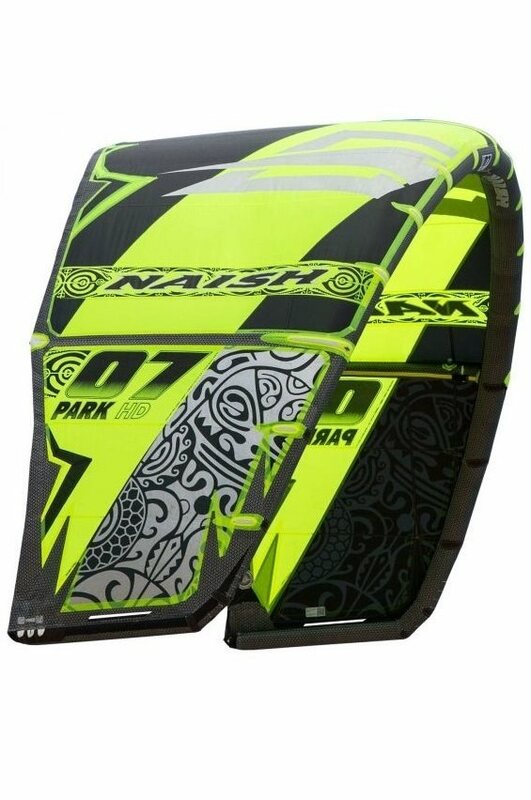 Our conclusion is that the 2011 Naish Park is a great Freeride weapon.